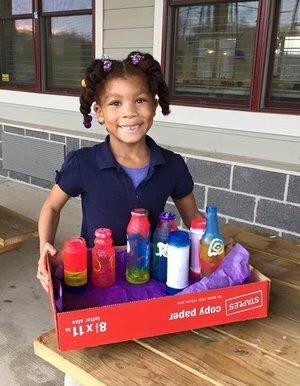 Our newest small grant recipient is So What Else, an organization that empowers disenfranchised children in the Baltimore-Washington metropolitan area through volunteer work and hands-on educational projects. We think that’s brilliant! Kids from low income families are always needing help. Here, they are the ones extending help to others through volunteer work, giving, and being a part of the community. Kars4Kids: Your website describes the 50-minute Olympiad, referring to the ten tenets of so what else. Can you list those tenets for us? Constant Growth: Always seek new knowledge and opportunities for learning and growing. Leave No Trace: We only have one planet, be respectful of your surroundings and minimize your impact by taking only what you brought with you and leaving nothing behind. Work towards living a zero-waste life! Compassion: Treat your peers with compassion and understanding and treat them with the respect that you would wish them to give to you. Non-Violence: Instead of taking out your frustration through anger, use rationality and understanding to stay calm and see issues from others point of view. Pay it Forward and Civic Responsibility: Take the selfless actions people have given expecting nothing in return and spread that kindness on to o Keep informed of your community and understand your role in it and what you can do to improve it. Continue the cycle of service and work toward being an engaged, informed, and helpful citizen. Positivity: Maintain an open, welcoming, positive attitude to help us create a safe space in which, together, we can learn, play and grow. Teamwork and Sportsmanship: When we work together we can create a synergy that takes us further towards our goals than if we work alone. Teamwork allows us to motivate and support each other’s strengths. Competition is only good when it is fair and positive. Kars4Kids: What are some examples of session themes for the 50-minute Olympiad? Asana Hamidu: We do plenty of sports games that are focused on building teamwork and sportsmanship. One example of that are the Track and Field games where we measure flexibility, speed and agility. Also, we have an everybody runs kickball game where kids receive their 45 minutes of necessary movement per day. On occasion, the kids love funs games like sharks and minnows and capture the flag (this one is a hit!). Kars4Kids: At your Green Path Academy, you’ve done bottle-bricking with the kids. Can you describe the process? Is this something the kids could do at home? Asana Hamidu: This is a fun and creative way to teach children about environmental stewardship. 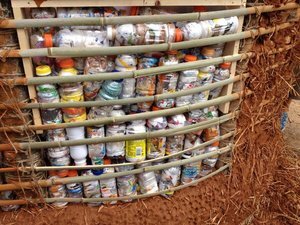 This process begins with making bottle bricks! This is when you take inorganic trash and fill the plastic bottles with them to make sturdy bricks. These “bricks” are then used to build art installations, benches, buildings and whatever your imagination can dream up. This activity brings the community together while creating something, beautiful and sustainable which will then serve as a daily reminder to reduce waste and take care of our environment. Kars4Kids: Your website speaks of 35 community partner sites. Can you list some examples? 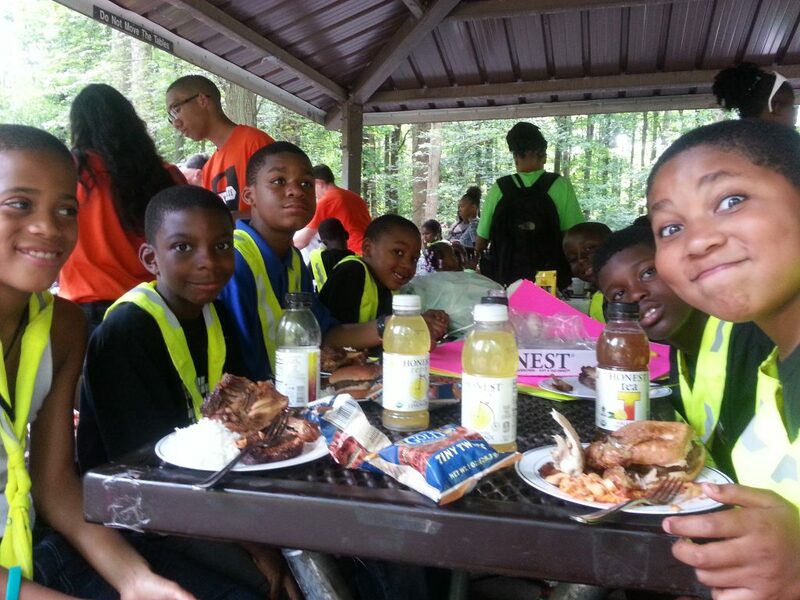 Nourish Now and Higher Achievement are collaborative partners for the after school and summer enrichment activities. Nourish Now, is a significant partnership. 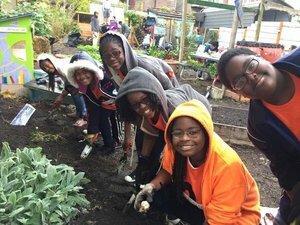 It is a food recovery organization whose mission is to end food waste, provides nutritious food for the after school and summer programs in low-income areas, where these students may not otherwise have access to nutritious options. We have a collaboration with them called Feed the Mind. The collaboration is focused on teaching under-served youth a range of healthy practices. Through this collaboration, each organization’s strengths are leveraged: Nourish Now provides fresh, healthy food, while So What Else provides a broad range of activity programs and volunteer opportunities. Another incredible partner is Leveling the Playing Field. They provide used and donated sports equipment for our programs. 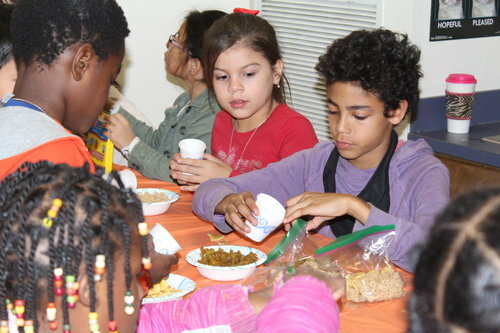 Kars4Kids: You mentioned the kids using gleaned produce to create Thanksgiving decorations for seniors. That’s nice, to do something to brighten their day and Thanksgiving. I see the kids are doing gardening in a local park. 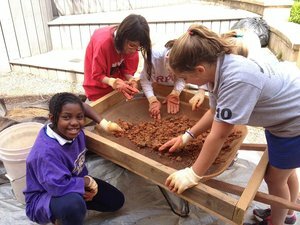 Can you talk about other pay-it-forward tasks in which So What Else kids are involved? Asana Hamidu: Throughout the year we have the students make little gifts to donate to the Thoughtful Treasure program for kids at NIH. We also frequently donate sandwiches or health care packs made by the students to Shepherds Table. Additionally, we have an on-site service curriculum where we are able to teach kids service activities right there at the center we are teaching. Examples include making dog toys out of old towels or blankets and donating them to an animal shelter, kids are able to relate very well and positively to issues like animal abuse. We also make sandwiches or toiletry bags for the homeless or those in need. So What Else takes to heart the principle of environmental stewardship. We involve our students in trash clean-ups where we not only remove waste but also teach how litter can get in our waterways and micro-plastic when mowed can even get into our foods. Students also come out to our community events on the weekends to serve alongside their mentors. Turning Point: A Volunteer Trip! Kars4Kids: How long have Founders Bob Schless and David Silbert known each other? What gave them the idea to start So What Else? Was it a cultural thing for them? Had they grown up doing volunteer work–doing nice things for others? Asana Hamidu: Bob and Dave met through fitness training. Dave was the trainer and Bob was the client. Both Dave and Bob had experience helping the community as Dave ran a Rehab Center for drug and alcohol and Bob sat on the Board at George Washington Cancer Center. The turning point for Bob and Dave happened after they traveled to New Orleans on a volunteer trip where they worked with Habitat for Humanity in the 9th Ward. After this experience, they came back to their own communities and asked themselves “What Else can we do to help?” They began this organization as a response to the critical need for youth development in Montgomery County. Kars4Kids: Are your summer camps the same hours as a typical work day? Are parents able to work, worry- free, knowing their kids are in your hands? What would happen to the kids over summer, were they not in your summer camps? Asana Hamidu: Our summer camps are the same hours as a typical work day. This gives parents and guardians a chance to continue working worry free. This is especially helpful over the summer, where parents may not have the resources to provide summer activities or have someone to look after their children while they are at work. We are grateful we get the opportunities to relieve certain stressors and contribute to the peace of mind of the families we serve. Kars4Kids: How do kids end up becoming part of So What Else? Asana Hamidu: A majority of the students are enrolled in after care at community centers; these community centers ask So What Else to run programs for the semester at their site. Students also sign up to be in our programs at their schools and we also have other sites at group homes. Kars4Kids: Have any of the kids from the early days of So What Else come back to say thank you? Do you stay in touch with any kids long term? Asana Hamidu: Yes! We have about four of those kids from the early days currently working for us. Also, we have lots of students that we continue to see year after year, especially at some of our summer sites like Kingman Boys and Girls Club, who always remember us and are glad to see us back. A few of our students have moved from student to volunteer to intern and in some cases staff. They are very thankful for the opportunities and we are even more grateful to have them! We also keep in touch with many of the students via our community service programming. Old students will come out to join us in service sometimes years later. So What Else gives kids a platform to always serve the community which is the beautiful thing about the whole movement, there is always something to do for good here. Kars4Kids: What is the dream of So What Else, going forward? Asana Hamidu: The dream is to make a marked impact with the kids we serve now. We hope continue providing programs that empowers the youth from underserved communities to live full lives through the focus of youth development, character building, recreation and community awareness. At the moment, we have successfully piloted a franchise in Baltimore over the last four years. The dream is already happening and it’s to keep going and keep getting better and keep enriching the lives of children we reach. We hope to establish a scalable model that could spread across the country and make a greater impact in the lives of countless youth. We employ the phrase, “You don’t have to be good to start but you have to start to be good,” and we are finally a good eight years in. We are grateful for supporters like Kars4Kids because with you, greatness is on the horizon!